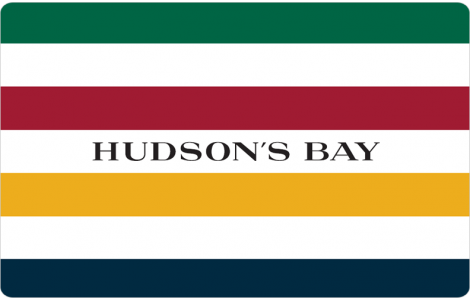 Convenient and easy to use, the iconic Hudson's Bay Gift Card offers compelling shopping experiences at 90 Hudson's Bay locations nationally and online at thebay.com (also redeemable at 50 Home Outfitters locations). Hudson’s Bay is Canada’s largest and most prominent department store, unsurpassed in its premier fashion, beauty, home and accessory designers and brands. Home Outfitters is Canada’s largest kitchen, bed and bath superstore, with an unbeatable selection of chic designer collections and favourite national brands. FOR CARD BALANCE INQUIRIES PLEASE VISIT ANY HUDSON’S BAY OR HOME OUTFITTERS STORE. Use of this card constitutes acceptance of the following terms, which may be revised at any time. The card balance can be redeemed for merchandise at any Hudson’s Bay or Home Outfitters (Déco Découverte) store in Canada, or at thebay.com. This card will not be exchanged for cash. No change will be given for any unused balance on this card unless required by law. The value on this card will not be replaced if lost, stolen or used without your permission. Protect this card like cash. This card cannot be used for payment toward a Hudson’s Bay Company credit card. This card may not be accepted by certain licensees. Hudson’s Bay, Home Outfitters, Déco Découverte and their associated designs are trademarks of Hudson’s Bay Company.